I think we need to help the Pharisee with his prayer. But I think his prayer could be made acceptable—or at least a lot more acceptable—with a few modifications (presuming, of course, that these modifications were made sincerely by the Pharisee himself!). We should say that because it’s true! If it was not for the grace of God we would be just as bad—or worse! But even if we have, by the Lord’s grace, been able to avoid some sins, we certainly have not been able to avoid ALL sins—and if we truly know ourselves we will be keenly aware of that fact. Which only goes to show that this Pharisee did NOT know himself very well! His original prayer indicated that he had absolutely no sense whatsoever of how prideful and arrogant and condescending he was—which is why that admission had to be present in his modified prayer in order to make it acceptable to God. Believe me, my brothers and sisters, that does not impress the priest! If anything, it DE-presses him—because a statement like that indicates the penitent really doesn’t know himself (or herself as the case might be)! We all sin every day—and if we truly know ourselves we will recognize that fact. We may not be sinning in big ways (although if you believe the statistic Fr. McCaffrey shared in his homily last week—that 85% of Catholic couples are using artificial contraception—then many ARE sinning seriously); but even if we’re only committing little sins of anger and gossip and selfishness every day, the fact is we’re still committing sins that need to be repented of and taken away! What really impresses me (and I dare say what impresses most priests) is when somebody comes into the confessional who seems to really be in touch with many of the ways that he or she offends God and other people. THAT’S impressive, because it shows that the person really knows himself or herself (like the tax collector in this parable really knew himself); and because it indicates that the person is humble, and wants to continue on the road to holiness and, ultimately, heaven. Now if we read that passage in isolation, we might get the idea that Paul was a guy who had an exalted opinion of himself, like the Pharisee in this parable had an exalted opinion of himself. These are not the kinds of things that the Pharisee in this parable would say; these are the kinds of things the humble tax collector would say. 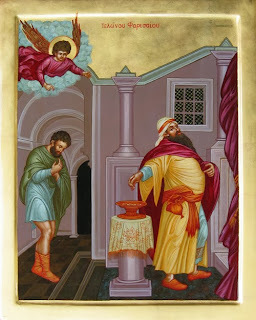 There are two extremes that must always be avoided in this life, my brothers and sisters: we must avoid thinking too much of ourselves (which, of course was the error of the Pharisee); but, at the same time, we must avoid thinking too little of ourselves (which is an error that’s equally as bad, because it can easily lead to despair). St. Paul had the balance—as did the tax collector in this parable! The tax collector knew his sins, just like Paul knew his. But he also believed that God loved him enough to forgive him. In other words, the tax collector knew he was a sinner, but he also believed that, in God’s eyes, he was worth pardoning! If he hadn’t believed both those things, he would never have said the prayer that he said. You don’t ask for mercy like he did, unless you actually believe that it’s possible for you to receive it. Maybe all this—maybe all that I’ve said in this homily today—explains why more people don’t go to confession on a regular basis: either they don’t believe they need it because they think they don’t sin, or they believe they’re too far gone and beyond the reach of God’s mercy. As I hopefully have made clear this morning, both those perspectives are wrong. St. Paul knew that; the tax collector in this parable knew that. And hopefully, now, so do we. Police Commissioner Edward F. Davis gave Glen James a citation in Boston. He did the right thing—which, for most people in his situation would not have been the easy thing to do. But then again, Jesus never said that doing the right thing would be the easy thing! In today’s first reading we heard that Naaman, the Syrian army commander who was afflicted with leprosy, went to the Jordan River, jumped in seven times, and was cured. He did that because the prophet Elisha had told him to. But for Naaman that was not the easy thing to do, nor was it the pleasant thing to do. In fact, when Elisha first instructed him on the matter, Naaman got really upset! He wanted Elisha to cure him with some spectacular ritual, or by having him bathe in one of the great rivers of his native Syria, not in the lowly Jordan River. But, as we heard a few moments ago, Naaman eventually did the right thing. So how far had they gone before they came to the awareness that something great had happened to them? How far had they journeyed away from Jesus before they knew that they had been healed? Five miles? Ten miles? Fifteen miles or more? We don’t know exactly—but it was probably far enough to make it extremely inconvenient and difficult to go back. So nine of them didn’t bother. Nine of them, apparently, didn’t even try. We are all challenged every day to do the right things out of love for Jesus: to say “thank you” to people who help us; to forgive one another; to be patient; to be pure; to be truthful; to be charitable—and it’s often not easy! Next weekend, Fr. Daniel McCaffrey will be here challenging couples to do the right thing in their marriages. By the way, this is why Pope Francis said in an interview a few weeks ago that the “proclamation of the love of God comes before moral and religious imperatives.” The secular press misinterpreted that to mean that the Holy Father was downplaying the importance of the commandments. Wrong! What the Pope was saying is that we need to focus on God’s love first whenever we discuss or consider the commandments, because God’s love is primary. St. Paul says here that Jesus Christ always remains faithful, even when we don’t. In other words, he always loves us (even when we’re in the state of mortal sin!). But he loves us too much allow us to stay in the state of sin! And so the perfect and faithful love of Jesus is always calling us to repentance, so that we can be restored to grace. Doing the right thing by repenting brings the reward of forgiveness—and the reward of eternal life if we persevere in the state of grace. Doing the right thing in other dimensions of life also brings a reward—in eternity, most definitely; but sometimes also here on this earth. And that’s a great bonus whenever it happens. Naaman’s reward, for example, was a physical healing. He was cured of his leprosy. As for Glen James, when his story became public a few weeks ago, a 27-year-old man from Virginia named Ethan Whittington (who’s never even been to Boston where James lives!) was inspired to do something. 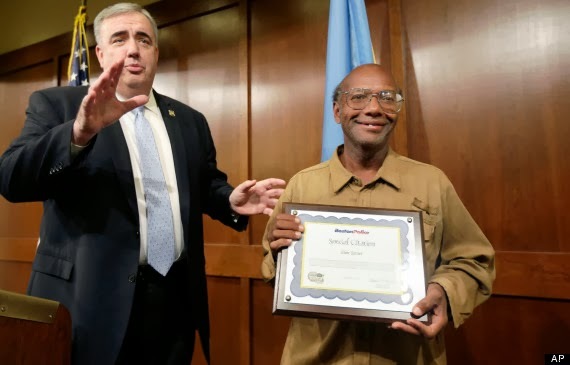 He decided to start an online fund to help Mr. James get off the streets and get the medical help he needs for his chronic illness (he has Meniere’s Disease—an inner ear disorder). Well, when I last checked it on Friday morning, the total raised from people all over the country was over $157,000! A pretty nice earthly reward for doing the right thing. He gave up a little more than $42,000, and he’ll end up with at least $157,000. May Glen James’ story inspire us to do the right thing even when there’s no earthly reward attached—and especially when doing the right thing is not the easy thing.